Edward Betts Hopper was born in around 1799 in Dover, Kent into a Quaker family – his parents were Robert Hopper and Abigail Betts. Parts of his life are shrouded in mystery – indeed, nothing is known of Edward’s early life – the first official record we have of him is his baptism on 20 March 1826 in Queenborough, Kent. Edward was around 27 years of age and the reason for this ‘adult baptism’ was almost certainly to ensure his forthcoming marriage on 25 April that year in St Botolph’s, Bishopsgate, London to Mary Dyne (a widow from Sittingbourne) – would be recognised in the Anglican Church. By this time, it seems, Edward was a man of wealth and property. He worked in the City of London for a large bank, and owned (and rented out) property in Dover and later Sittingbourne. 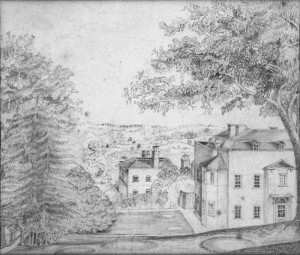 Edward was something of an amateur artist and painted a self-portrait as well as a clutch of pencil sketches of what is described as his home on Hampstead Heath in London (although as yet there is no confirmation that the property belonged to him). By 1839 Edward Betts Hopper was an influential member of the New Zealand Company – the Company originated in London in 1837 as the New Zealand Association with the aim of promoting the systematic colonisation of New Zealand. It intended to follow the colonising principles of Edward Gibbon Wakefield, who envisaged the creation of a new-model English society in the southern hemisphere. The New Zealand Company later established settlements at Wellington, Nelson, Wanganui and Dunedin and also became involved in the settling of New Plymouth and Christchurch. It reached the peak of efficiency about 1841, and it was just before this – on 16 September 1839 – that Edward set sail from London bound for the islands as a cabin passenger on the ‘Oriental’, together with his friends the Hon. Henry Petre and Francis Molesworth. On the Saturday before setting sail, the directors of the New Zealand Land Company, together with a large number of people interested in the colonisation of New Zealand, made an excursion to Gravesend to visit the vessels Adelaide, Aurora and Oriental, which were moored immediately below the town. The object of the visit was two-fold. First, to see that their instructions for the comfort and convenience of the emigrants upon the voyage had been carried into effect; and, secondly, as the sanction of the Government has been withheld from the undertaking – as the infant colony has been left without the aid or protection of the Colonial Office – as no steps have been taken to secure the administration of English laws upon a soil that Englishmen are to inhibit, and as all the hopes, which, up to the eleventh hour the company have entertained, of even a slight recognition from the Colonial Secretary, had been disappointed, under these circumstances, the second object of the directors was to obtain, if not from each of the emigrants, at least from the great body of them, a voluntary agreement to a charter or ‘code of law’, laying down regulations for the maintenance of order, and establishing a machinery for the administration of law, and enforcement of justice. The first ship to be boarded was the Adelaide. After an examination of the vessel, the passengers and emigrants being assembled, Mr G F Young, the principal director present, addressed them. 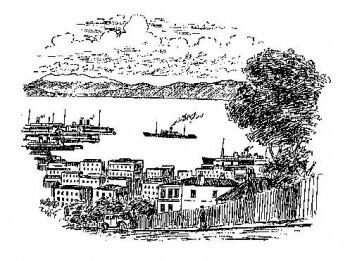 They were at sea 126 days, finally arriving in Port Nicholson, Wellington on 31 January 1840. There were 33 couples on board, 28 single men, and only 3 single women. There were 25 children on board as well. Thanks to records kept by the ship’s surgeon, Dr J P Fitzgerald, we know that during the four months at sea there were three fatalities (2 infants, 1 adult) and a total of 8 births. The three wealthy young men – Hopper, Molesworth and Petre – had brought with them many heavy things, including a steam engine (the first in the Wellington area) which would eventually be used to drive a saw mill and flour mill at Newry (Molesworth’s property) in the Woburn Road area of present-day Lower Hutt. However, when they first landed, the three partners had no derricks to land the machinery and needed trees overhanging the water to improvise lifting gear. Because of this, the ship didn’t stop at the mouth of the river but sailed about a mile upriver to where Captain William Mein Smith, the Company’s surveyor-general, was clearing land on the western banks. Three weeks later, a settlement with shelter for two hundred people was complete. They set about the development of the lower Hutt Valley/Petone area and together they had the first steam engine in the Wellington area, driving a saw and flour mill at Newry (Molesworth’s property) in the Woburn Road area of modern Lower Hutt. Edward was killed in a tragic accident on 17 September 1840, just 9 months after his arrival. It was recently our painful task to record the death by drowning of several of our fellow Colonists. We have now to perform the melancholy duty of announcing the death, in a similar manner, of Edward Betts Hopper, Esq. It appears that Mr Hopper, Mr Petre, and some workmen, had been engaged, on Thursday last, in getting timber, and were descending the River Hutt with a load, when the boat struck against an unseen snag, and Mr Hopper, who was standing in the bow of the boat, was thrown into the water. Every exertion was made to save Mr Hopper, but from the inability to aid himself, there is reason to believe he had been stunned in falling into the water; though oars and other things were thrown him, he made no attempt to catch hold of them. The body was recovered after being in the water about fifteen minutes, and every effort to restore animation was resorted to, for several hours, but without any prospect of success. Dr Stokes was early in attendance, but the unfortunate gentleman was beyond the reach of human aid before taken from the water. 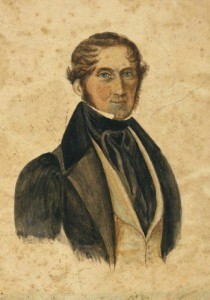 Mr Hopper was one of the earliest and most zealous members of the Association formed to colonize New Zealand, and through all the difficulties with which the friends of colonization had to contend for several years, he remained steady to his purpose. When it was determined to take the steps which led to the formation of this settlement, Mr Hopper joined the hazardous undertaking with energy and proved his conviction by sailing in the first expedition. From the time of his arrival here he has been engaged in extensive mercantile transactions. He was a Director of the Branch of the Union Bank of Australia; he was a large landed proprietor. and as he was universally respected, his untimely fate will be severely felt, and long deeply regretted. “I have now to inform you that as Uncle Hopper was bringing some sawn timber down the river, the boat struck against a piece of sunken timber, and as he was standing in the bow of the boat, he was thrown forward, and though Mr. Petre and two men were in the boat, and every exertion made to rescue him, it was too late, his body was in the water nearly a quarter of an hour before taken out; though medical assistance and stimulants were applied, his life had fled. â€œAn inquest was held by the magistrate, Mr. Murphy, who was also requested to inspect Uncle Edward’s papers, and after considerable trouble we found a copy of his will, by which Thomas Pilcher and Thos. Turner of Sittingbourne are appointed executors. You may better imagine the loneliness of our situation than I can describe it. We are strangers in the land and have no one to whom we can look for support and consolation; but we must patiently submit to the Divine dispensation. It is most probable the partnership will be dissolved between Mr. Petre and Molesworth, and I am not certain as to what steps I shall have to pursue. Edward Betts Hopper had, indeed, left a will, dated 31 January 1839 (the year before he left for New Zealand). Â The contents of the will not only gives an idea as to Edward’s wealth (he would have been a multi-millionaire today), but also sets new riddles about his life before New Zealand. On 27 August 1841 John Boyton appeared to confirm that he witnessed the will and the will was proved London 21st September 1841. 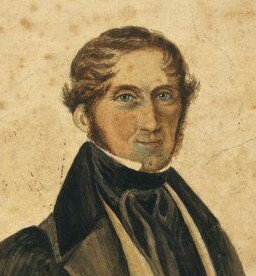 ‘NOTICE – All persons having any DEMANDS on the ESTATE of the late EDWARD BETTS HOPPER, Esq., late of Sittingbourne and Dover, in the county of Kent, (who died on or about the 17th of September, 1840, in New Zealand,) are requested to send an account of such claims to Mr Thomas Turner Sadler, Sittingbourne, Kent or to Mr Thomas Pilcher, 2 Sion-place, East-street, Old Kent Road, Surrey, the executors, in order that they may be examined; and all persons who stand indebted to the estate of the said Edward Betts Hopper, Esq., are requested to pay the amount to the said Executors, or one of them, forthwith – Dated this 24th day of September, 1841.